She paused as the M2 Limited bus shuddered to a sharp stop on Madison Avenue. She looked toward the front, ostensibly toward the driver causing her interruption, and swiveled her head back past me–licking her peach-painted lips quickly, absent-mindedly. She looks again in my direction. Frosted hair. Ample thighs in smooth mocha leather pants. Green eyes. This work keeps her feeling young. In 1811, the Commissioners of New York City approved a plan that dramatically altered the topological, economic, and (I’d argue) spiritual landscape of the city. The grid plan was devised from maps made by surveyor John Randel Jr., and it is this plan that required the leveling of the place that the Lenape Indians had called “the island of many hills,” or mannahatta. Writers and designers from Clement Clarke Moore to Edgar Allan Poe to Frederick Law Olmsted lamented the changing of the landscape and, in the latter’s case, one was able to preserve and re-create a central location in Manhattan that recalled for residents and visitors the island’s varied ecological wealth. 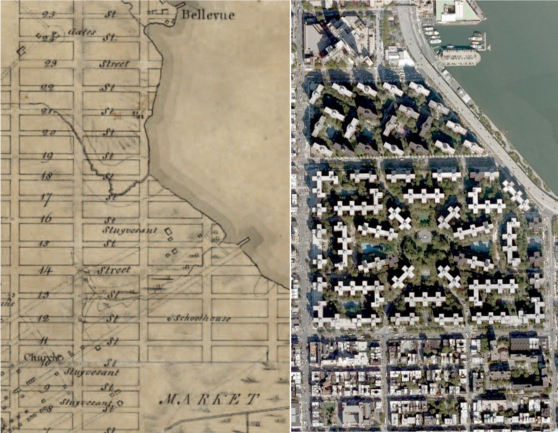 This grid, though, also paved the way for Manhattan to become arguably the world’s most influential city, by both monetizing its square footage and also attracting the world’s leading moneymakers and artists (Cf. “Triumph of the City,” Edward Glaeser), as well as the poor and new immigrants, both seeking opportunity. The GDP of the NYC Metropolitan Area in 2012 was $1.33 trillion, the highest of any city in the U.S. and ranked 13th even among countries, following Australia and ahead of the likes of Spain, Mexico and South Korea. A report by the McKinsey Global Institute ranks New York as first among cities for GDP by the year 2025, though only 10th in population, underscoring the density of GDP per capita. In light of this influence, living in New York City became synonymous with “making it.” If you can make it here, sang Sinatra, you can make it anywhere. Success, money, and fame are the siren calls for Americans who move here; “streets paved with gold” and the opportunity to earn enough money to send some back to families living halfway across the globe or to start anew with one’s family here is the draw for new immigrant groups and even the poor looking for a job. Having a Manhattan mailing address, and having a (212) area code, are also synonymous with status. Living in one of the “outer boroughs” is akin to banishment. (Though this is changing, as Brooklyn has allure to many and is becoming once again almost its own city.) Therefore, a spiritual malady that infected the first Dutch settlers 400 years ago has been passed to the current generation who live here and to adolescents around the world who yearn to come: to live in New York—“to be a New Yorker”—is to be inherently worthy. It is to be assigned value. The grid cemented this thinking. Yet—and at the risk of abusing the construction metaphor—the jackhammer of prophetic voices now calling people, particularly Christians, to serve the city, and the spade and trowel of urbanists, city planners, restorative architects and landscape designers can re-fashion Manhattan into an island of many hills once again. These hills need not be physical to be effective. Rather, our spiritual wholeness will allow us to see that topological variety can be realized by ensuring that affordable housing is created in desirable neighborhoods. Likewise, any good ecosystem—one that is also beautiful—must be sustainable and symbiotic with adjacent ones. This points to the need for mixed use areas, varied architecture, businesses that are locally run and serve the needs of the community, and active Community Boards that allow for residents themselves to maintain that ecosystem alongside other ecosystems (neighborhoods). The “physical” space of New York City in the 21st century and beyond must be a place of varied urban ecologies the way mannahatta once was for the beaver, the bear, the oyster. The destruction of the natural habitat started long before the grid, when one group (the Dutch) presumed to “own” the land and “bought” it from the Lenape. This was a foreign concept to the latter group, which saw its role as one of steward, as “husband” of this topology and its natural environment. The Lenape and other native tribes, in fact, viewed their decisions in light of how they would affect seven generations out. Today’s leaders have the same opportunity for vision and spiritual wholeness—wholeness that is mindful of what seven generations out will need and want. Just as an unbridled capitalism of Wall Street would concentrate wealth in the hands of the few, so too an unchecked hand of the State (through city government) would redistribute that money in a way that concentrates power in the hands of a few. Therefore, our spiritual wholeness allows us as citizens to manage abundance well and to give responsibly, generously, even sacrificially. This is the history and the future of New York. The southern border of the grid, on and around 14th Street, embodies the old and new, the past and the future. I took a walk there one day—from Hudson to East Rivers.